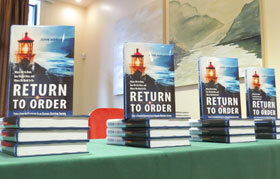 Dublin’s Buswell Hotel seemed a fitting place to launch the book, Return to Order. The atmosphere inside the conference room that July 25, was restrained, somewhat formal yet also inviting. Buswell’s is a traditional hotel right in the city center with the Parliament building just across the street and Trinity College nearby. One could almost expect to find Edmond Burke, a famous 19th century alumni, to walk in from the rain to join in the discussion. At the back of the room were the omnipresent tea and biscuits that remain a faithful companion for any social or family occasion in Ireland. Buswell’s was the most representative stop on the short whirlwind book signing tour throughout Ireland. It hosted a varied group that was comprised of Catholic students, conservative leaders and pro-life activists who were polite, passionate and intense. Topics of conversation revolved around the present economic crisis and especially what the book describes as frenetic intemperance. This reckless spirit inside certain economic sectors seeks to throw off all restraints and gratify all passions. 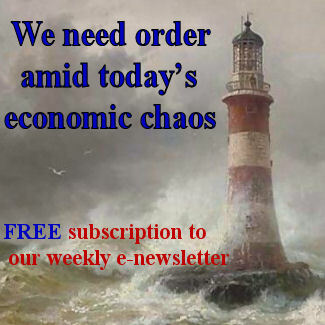 Many Irish can relate to frenetic intemperance since their famous “Celtic tiger” economy imploded in 2007 and their economy has yet to recover. Another topic that took center stage in discussions was the machine-like aspect of modern economy, especially as it applied to the massive regulations being imposed upon Ireland by the European Union. Travelling across Ireland, one still perceives the social ties that bind. There is that sense of family where everyone still knows most locals that helps reinforce a strong regional identity that is refreshing and reassuring. Organic Christian society still lingers on in many places and a call to return to this order was very well received. Perhaps it was the book’s emphasis on organic Christian society that resonated the most among our Irish friends. Ireland is still a nation very much rooted in family, community and the Catholic Faith. They are concerned about modernity’s corrosive influnece on the culture and Catholicism. Indeed, at the time of the launching, a grueling debate over abortion polarized the nation and unleashed 60,000 protesters in the streets in this nation of 4.5 million. It was, however, talking with the Irish that one comes to really understand Ireland. At Buswell’s, the presentation of the book ended with an animated discussion that revealed a great deal about the strong personality of the Irish. 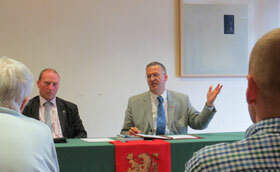 Questions and commentaries created a convivial and refreshing atmosphere for the exchange of ideas and opinions. Later over tea and biscuits, the conversation continued yet a few more hours. Perhaps the point that touches a visitor the most is the profound Catholic spirit of the Irish that could be seen everywhere during this whirlwind tour. There is no denying that the nation has suffered, like all nations, from the crisis inside the Church and society. Vibrant signs of the ancient Faith are still apparent everywhere including many impressive churches, the ruins of monasteries and the roadside shrines. More importantly, the Faith is found in the hearts and souls of the Irish oppressed by today’s secular society, waiting to be free from the yoke of secular humanism. 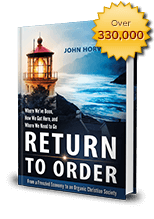 This entry was posted in Featured and tagged Christian civilization, economic crisis, frenetic intemperance, leadership, Return to Order by John Horvat II. Bookmark the permalink.